Students celebrating at the awards ceremony. 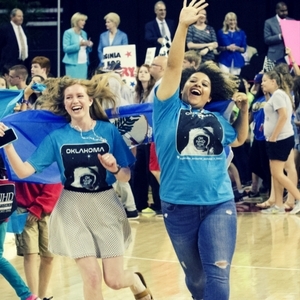 WASHINGTON, D.C.—This summer, the brightest young historians in the world will take a stand in history to compete for thousands of dollars in prizes and scholarships at the National History Day® Contest. From June 11-15, the winners of 57 affiliate level contests will present their projects at the University of Maryland, College Park. Affiliates include all fifty states, the District of Columbia, American Samoa, Guam, Puerto Rico, China, Korea, and South Asia. Each year, more than half a million students create historical research projects in one of five categories: documentaries, exhibits, papers, performances, or websites. The 2017 theme for the contest is Taking a Stand in History. In a year that has seen numerous marches on Washington and an increase in civic engagement, students will be presenting hundreds of projects about positions that people have taken throughout our country’s history and the individuals and groups that supported them. The contest kicks off with a welcome ceremony on Sunday, June 11 at 6:30 p.m. Filmmaker Ken Burns will address the students, speaking about his own experience telling the stories of history and offering encouragement to the thousands of anxious young students before judging begins on Monday, June 12. In addition, Ken’s long-time partner and co-director of the upcoming film, THE VIETNAM WAR, Lynn Novick, will participate in a teacher workshop where she will discuss the making of the documentary and preview the teacher resources being created to accompany the film. THE VIETNAM WAR will premiere on PBS on September 17, 2017 (more information is available at: http://pbs.org/vietnam). On Monday and Tuesday students will present their projects to judging panels of educators and historians. Highest ranked entries will make it to a final round that takes place Tuesday and Wednesday. Finally, on Thursday, June 15, the awards will be announced at a colorful celebration of history at the Xfinity Center on the University of Maryland, College Park campus. The top entries in each category can win any number of honors, including category awards, scholarships, outstanding affiliate entry awards, and special prizes. These prizes are made possible through the generous sponsorship of individuals, groups, and organizations, including the National Endowment for the Humanities and the National Park Service. Three high school participants will receive full or partial scholarships from Case Western Reserve University, Chaminade University, and the University of Maryland, College Park. For a list of all special prizes, visit nhd.org/special-prizes/. The awards ceremony for the National History Day Contest will be live-streamed on Thursday, June 15 from 8:30 a.m.-12:00 p.m. on nhd.org by Skehan Communications LLC. Following the ceremony, awards will be announced via National History Day social media outlets and posted on nhd.org. Founded in 1974, at Case Western Reserve University, National History Day has grown from a contest of a few hundred students to an international educational organization promoting the appreciation of history education. More than half a million students, who are guided by more than 30,000 teachers, participate in this project-based academic competition annually. About National History Day: NHD is a non-profit education organization in College Park, MD. Established in 1974, NHD offers year-long academic programs that engage over half a million middle- and high-school students around the world annually in conducting original research on historical topics of interest. These research-based projects are entered into contests at the local and affiliate levels, where the top student projects have the opportunity to advance to the National Contest at the University of Maryland at College Park. NHD also seeks to improve the quality of history education by providing professional development opportunities and curriculum materials for educators. NHD is sponsored in part by, HISTORY®, Jostens, the National Endowment for the Humanities, the National Park Service, Southwest Airlines, the Joe Weider Foundation, and the WEM 2000 Foundation of the Dorsey & Whitney Foundation. For more information, visit nhd.org.